Almost 58,000 New Jersey men served in the Civil War. With reenlistments, the state would eventually receive credit for more than 80,000 terms of service. Its men fought at Gettysburg, Antietam, Spotsylvania, the Wilderness, Winchester, etc. : they saw tragedy and triumph while participating in the nation's epic struggle. 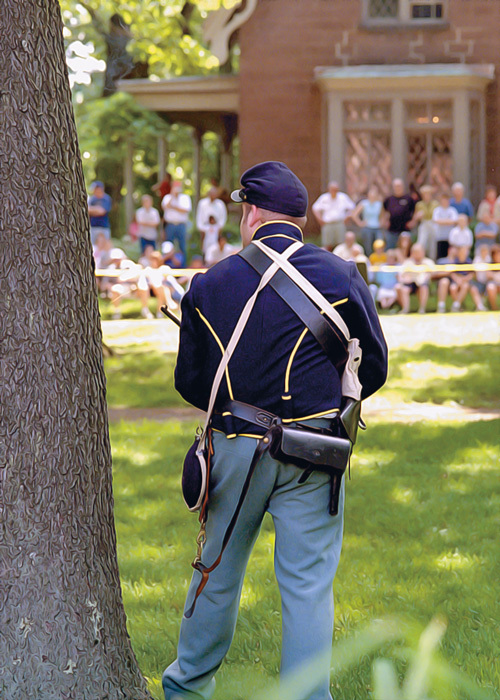 140 years after the start of Lieutenant General Ulysses S. Grant's Overland Campaign, the men and women of the war years still receive vivid tribute in reenactments, living history demonstrations, and round tables. Over the summer, infantry, artillery and cavalry reenactors form an integral part of commemorative activities throughout New Jersey. "We have to be fit enough to jog a quarter-mile and march thirteen to fourteen miles a day, sometimes in heat or mud. Still, it's nothing compared to what the infantry went through," says First Sergeant Hugh Brennan, a twelve-year veteran of the 3rd New Jersey. "Once you walk a mile in their shoes, you understand how difficult it was." Physically demanding, but not a sport: reenacting entails following a carefully scripted sequence of events. At the same time, the staged battles are not quite theater ­ in the way the thrilling chariot race in Ben Hur is not quite a movie. Participants refer to reenacting as a hobby. Recruits beware; as hobbies, stamp collecting and the recreation of Civil War battles exist in separate realms. The first issue for potential recruits is cost. Members adhere to a strict dress and weapons code. Uniform buttons come from the same Connecticut company that manufactured them for the original soldiers; anyone requiring glasses must invest in period eyewear. An estimated cost of the basic uniform ­ which includes a forage cap, sky blue trousers, an appropriate coat, belt and buckle, four button shirt, suspenders, cartridge box/strap and box shield, canteen and shoes ­ hovers between $450 to $500. Add in a replica musket rifle ­ made in Italy ­ and the cost rises another $400 to $450. In addition, to sleep and eat in camp requires a tent and period utensils. Subsequent issues develop around time and safety. For devotees, an avocation can be as time consuming as a vocation. The big battles, often categorized as a Maximum Effort Event, the designation refers to regimental attendance efforts. The hobbyists bestow promotions on members of their company and regiment; officers often find their duties within the unit rise accordingly. Everyone trains regularly for public demonstrations of skill and knowledge. Read first. Study the battles, the tactics, and the leaders. We follow a military structure of rank. Then decide. We spend a lot of time drilling, learning how to handle the muskets. We have complete weapons inspections, focusing on control for safety," says Sgt. Brennan. 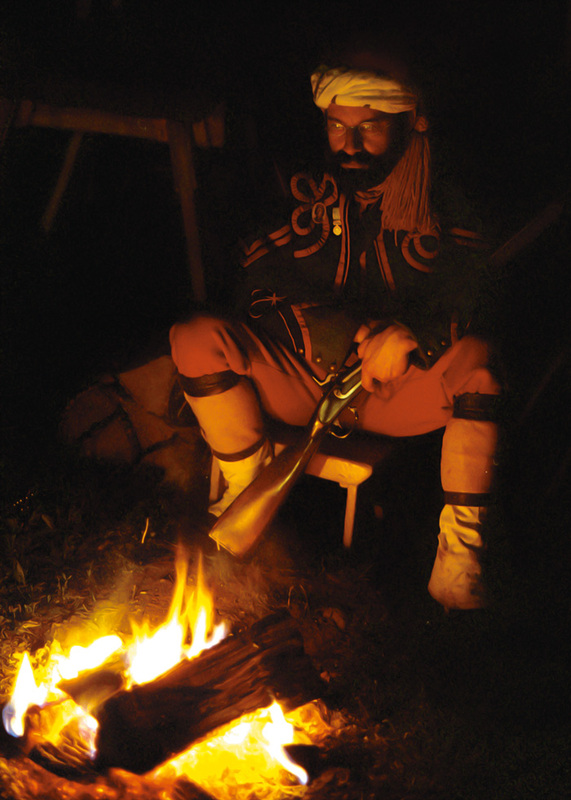 Nonetheless, reenactors suffer from gunpowder burns, dehydration, and heat exhaustion. The cavalry seems especially prone to broken bones. Sgt. Brennan shrugs off the risk: "More guys get hurt around the campfire." There is a limit to the quest for realism: most reenactors prefer to study hospital gangrene, chronic diarrhea, amputations and the execution of deserters from a distance. For the public, the 7th New Jersey Infantry Hospital offers a gritty depiction of battlefield medicine. Twenty members assist with trauma cases and catastrophic amputations. "We tell people what we will be doing. We use theatrical makeup and fake blood to make the wounds and surgery look as realistic as possible," explains Michelle Catona, a nurse with the Infantry Hospital. She frequently treats her husband Mark Catona, a Sergeant with Company A of the 7th New Jersey. "He's lost his hand a number of times," she laughs. "Fortunately it grows back." Typically, the organizers try to avoid more mundane hardships: on its website the 14th New Jersey, Company H, gracefully concedes the use of motels for members unaccustomed to sleeping on straw-covered ground. In the field, the soldier-volunteers need their sleep. Their war games ­ the highlights of the hobby ­ can last through a weekend. One set of exercises, called Tacticals, uses Civil War strategies to test combat skills and knowledge. For depictions of the great battles ­ Gettysburg, Winchester, Spotsylvania, the Wilderness, and Cedar Creek, among others ­ New Jersey's representatives join "regiments" from the north and south to replicate as closely as possible the excitement and deafening thunder of attacking infantry, artillery, and cavalrymen. In early May, New Jerseans loaded up their vehicles and headed south. "If you've grown up boy scouting, it's a lot of fun," Sgt. Brennan says. He describes his group as a mixed bag of typical Jersey guys, their ages ranging from 16 to 44. The unifying force is a passionate interest in the era, and the trips that forge a sense of camaraderie. By the carload, reenactors arrived at a site near Spotsylvania Court House, Virginia, to depict the vicious, hand-to-hand combat at the battle of Bloody Angle. Above: Eileen Anderson portrays a hardscrabble farmer’s widow who has joined the Confederate cause. 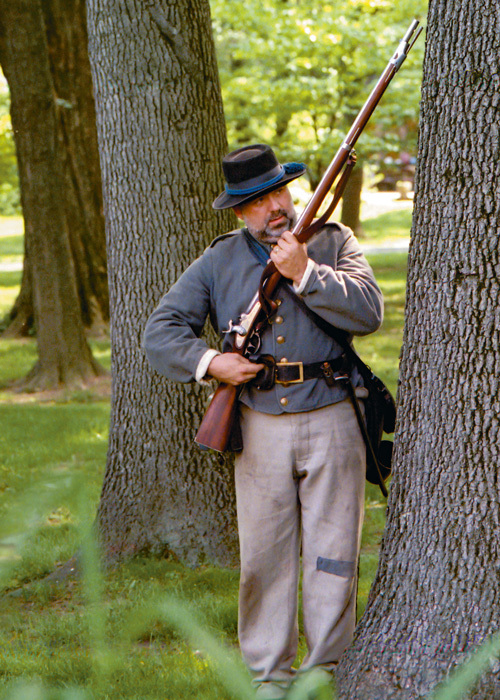 Below: Jeffrey Rodriguez in Zouave infantry dress. Their colorful uniform, based on those of the famed French colonial troops, and their effectiveness in combat won these volunteers universal respect. Friday afternoon thousands of reenactors struggled to set up a military-styled camp in a gale-force storm. Wind buffeted the rows of white tents. (The members of the 14th unanimously declined the option to go to a motel.) The Confederate reenactors camped in the trenches. The organizers decided to break the battle into two parts; staging the twenty-hour struggle in its entirety would be like staging Richard Wagner's The Ring. Saturday afternoon, after a night on soggy ground, the combatants delivered the first depiction of the conflict at the Mule Shoe. That night the volunteers slept in their uniforms. Sunday morning, as a chilly mist covered the ground, a 4:00 a.m. reveille traveled through camp. Gradually the troops, fell into formation. Carrying musket rifles, canteens, and battle gear, the troops marched to the battle site. Civil War buffs by the thousands had begun to arrive. As dawn broke, 4,000 Union and Confederate reenactors converged. Lawyers, policemen, psychiatrists, firemen, plumbers, fathers and sons fell into a time warp. Men shot black powder at each other and fought hand-to-hand in the trenches. Adrenalin levels rocketed skywards. Shouts rose from the trenches; in the orchestrated chaos, Confederate and Yankee units lost men to wounds, death, and capture. The battle ended as quickly as it began; while most Virginians were still considering breakfast, dead and wounded combatants stood up and brushed dirt off their uniforms. Shivering away their goose bumps, the spectators gradually dispersed. Volunteer-soldiers returned to camp to pack up the tents. By 10:30 a.m. the weekend warriors started the five-hour drive home to Central New Jersey. Some grappled with cognitive dissonance, reliving 19th century combat as they reentered a life of turnpikes, cell phones and internet usage. Few stayed for the second staged battle. The hobby demands support from the home front, and it was Mother's Day. A week later the combatants were still winding down. "We talk about some of the battles for years. Any predawn or dawn battle has a realistic atmosphere. Especially when there are no modern intrusions," explains Private Ken Coanshock of Co. H, 14th New Jersey Volunteers. 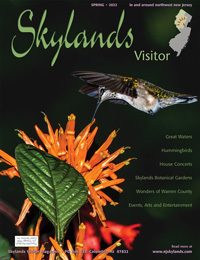 "In Spottsylvania, you're in the thick of it. It's confusing, you get lost, misguided, people are yelling instructions and it's hard to tell who's shouting what. It's easy to imagine what it was really like." Leveraging the natural interest of children, the Catonas turned reenacting into a family affair. Their own children play-act as civilian children in camp and around the hospital. Inured to hospital scenes, the children are familiar with Nurse Catona's patter as she weaves lessons about the horrors of war through hospital experience. "We are play-acting," she explains. "We get up after we're shot. We remind the kids that guns are real, and the damage they cause is real." Reenactments and living history offer children the opportunity to glimpse what text books can't depict. As part of The New Jersey Civil War History Association, Inc., Company H of the 14th New Jersey Volunteers visits schools and performs in public regularly. "Younger kids are dumbfounded," says Private Croanshock. "The thirteen-to-seventeen year olds are the most interested. At schools we're sometimes approached by kids who ask where they can sign up." If the children are interested, the adults are obsessed. "Hang out with us and you'll become a time-vestite," says Robin Stokes, a mid-19th century clothing historian. It's hard to tell if the greeting is meant as an invitation or threat. Robin and Wesley Stokes participate in Living History activities. To design realistic clothes, Robin haunts the internet in search of womens magazines from 1861-1865. Following the illustrations, she creates dresses, with appropriate hoops, wrappers, petticoats, and trim. From surviving bolts of 19th century fabric, she orders custom runs and makes special order dresses; she also sells to a store in Gettysburg (Abraham's Lady) off the rack. The results are so convincing that she stamps dresses with her name and year lest, 100 years from now, surviving creations be mistaken for original period pieces. Her replicas hang in most of the vignettes at the Civil War Museum in Harrisburg, where Robin serves as Assistant Guest Curator for a show titled "Essential to the Cause; Women's Roles in the Civil War." 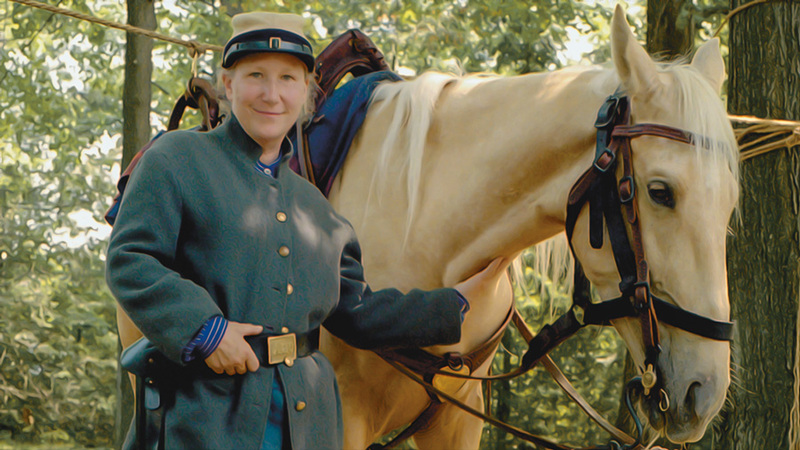 She also participates at different events as a civilian reenactor, and sews costumes for her husband's role in Mr. Lemuel's Red Mill Serenaders. The musicians give summer performances at the Red Mill; to the delight and awe of children, Wesley Stokes plays percussion by scraping a bone along the teeth of a massive mule jaw bone. "Living History is more accessible," claims First Lieutenant Robert Costello of Company D, 2nd Rhode Island Volunteers. "Fewer spectators come to the tents when we're camped in the field. They seem more comfortable at the exhibits, where we get all kinds of questions about clothing, weapons, and history." For a change of pace, Lieutenant Costello frequently steps out of uniform. He shaves his beard in Quaker style, following the line of his jaw, and blackens his hair with actor's dye. With a stovepipe hat on his head and a dark suit over his tall, lanky, frame in a long dark suit, he morphs into Abraham Lincoln. Ever popular, Abe's appearance is requested for numerous occasions. If the role sometimes requires a Mount Rushmore-sized patience (spectators at Gettysburg asked Abraham Lincoln, a.k.a. Robert Costello, when George Washington would appear), it also provides odd, unexpected pleasures. One year a group of South Koreans recognized the sixteenth President of the United States. Through an interpreter, they explained how, as school children, they had been required to commit to memory the Gettysburg Address. While many reenactors adopt a low profile in the winter months, round tables function year round. The Library of Congress estimates that "more than 70,000 books have been written about the U.S. Civil War ­ and more join that body of work each year." Fiction, histories, diaries, etc., provide fertile ground for New Jersey round tables. In December 2000, Harry Carpenter founded the North Jersey Civil War Round Table. Thirteen people met in January 2001 at the Morristown Club. Years later, a thriving club meets monthly at the Frelinghuysen Arboretum to listen to guest speaks on topics ranging from Gen. William T. Sherman to "Lincoln and Great Women of Women's Suffrage." In February the reenactors, living historians, and civil war buffs celebrate Abraham Lincoln's birthday at a ball in Philadelphia. Formal period clothing is de rigueur for the event. It is a modest but fitting tribute for a man whose spirit still graces the reenactments: as confederate and union soldiers come back to life and men prepare to walk off the field, they stop to perform a time-honored ritual. "At the end of every battle, union and confederate soldiers take their hats off," says Lieutenant Costello, "and someone plays Taps."